DayBack helps you make better decisions by showing your resources and events in context--in the context of your other projects and your Google Calendars. Once you know that you're making plans and promises you can keep, you can start blocking off time for your most important work. We're looking forward to your feedback. And thanks for checking out DayBack! 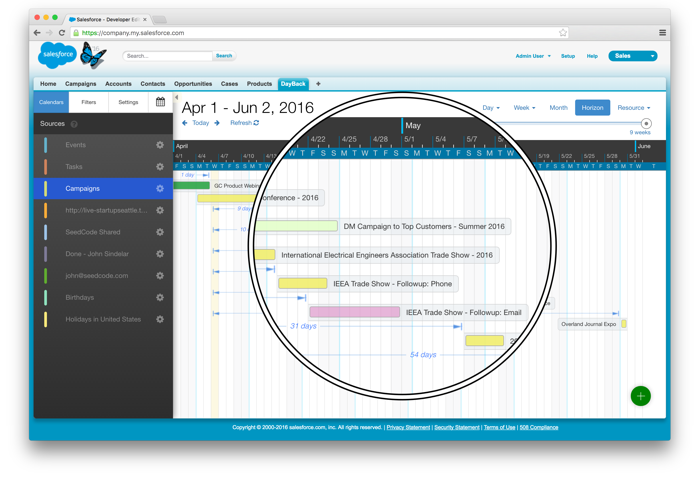 After you install DayBack it will show you the Events, Tasks, and Campaigns in your org, and will create a folder of your users as resources. That's it, you're ready to start using it. You may want to add DayBack to your tabs so you can get to it easily. Resources: scheduling your people, rooms, trucks, or other assets that are often over-scheduled. We really hope you'll link DayBack Online with your own files and let us know how that works--not only how the integration works but how the calendar compares with whatever you're using now: an older FileMaker Calendar, iCal, or something else. There's nothing to set up =) DayBack will pick up your Events and To-Dos, creating a filter for each project in your calendar's left-hand sidebar. Basecamp is a newer integration for us, so please get in touch and let us know what you'd like to see h ere. Going further, you may want to add your own buttons to the calendar, change its appearance, or learn how to publish schedules to folks that aren't DayBack or Basecamp users. We hope DayBack can make a big difference for your team! As soon as you give DayBack permission to see your Google Calendars, DayBack will show each of your calendars in the left-hand sidebar and you're ready to go. DayBack adds a resource and status field to Google so you can start categorizing events and making sense of your busiest calendars. Going further, you may want to add your own buttons to the calendar, change its appearance, and publish schedules to folks that aren't DayBack users. While Google lets you share whole calendars, DayBack's sharing lets you share just a portion of a calendar and then set that share to expire. More here: sharing.